How can I adjust the music level to speech on a different track? The case you are reporting is a very typical scenario for interviews, when you want to edit and mix two tracks of audio: one with speech, the other one with music. Check the steps below for how do this in Nero Video. Go to advanced editing mode. 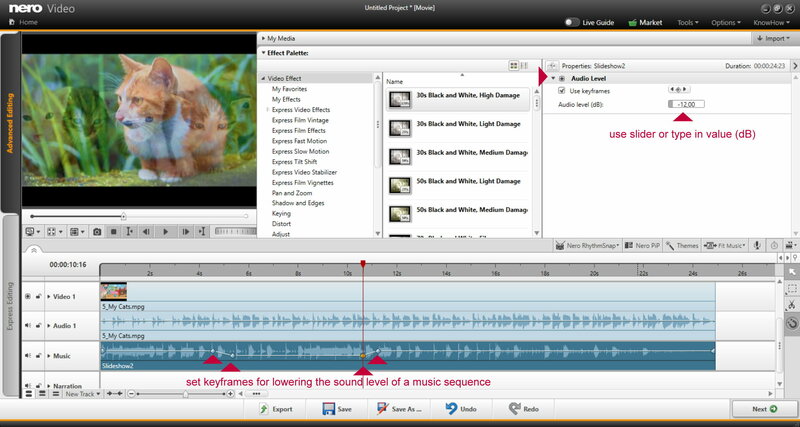 In the example below you have two tracks in parallel: one audio track with speech linked to the video in track 1, one with music in the music track. Use the dB slider for lowering or increasing the volume per track (you can also type in e.g. -6 dB, if you want to decrease the volume by half. Tip: You can also set keyframes (when selecting ‘Use keyframes’) allowing you to do sequences of different loudness settings over time. This is very convenient when you want to match music to interviews, etc.